MyWay IPA has become something of a flagship for Blasta, a grapefruit IPA that helped put the Perth brewery on the map. So, when they celebrated their first birthday, head brewer Steve decided to take the beer to the next level by giving it more of everything: more hops, more malt, more ruby grapefruit, more blood orange and more booze. The original MyWay weighed in at 5.9 percent ABV and 45 IBU; big brother comes in at 6.7 and 53 respectively. It's easy to see why MyWay (original and Amplified) has become a favourite tipple for those who frequent the brewpub in Burswood. The beer is packed full of tropical fruit flavours, citrus and pine, all balanced by a well-judged caramel malt backbone. The locally-sourced grapefruit and orange sourced locally adds a welcome pithy mouthfeel and assist with the bitterness too. 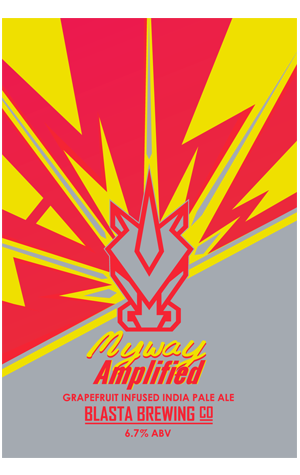 They say bigger is better and the Amplified MyWay is liquid proof.